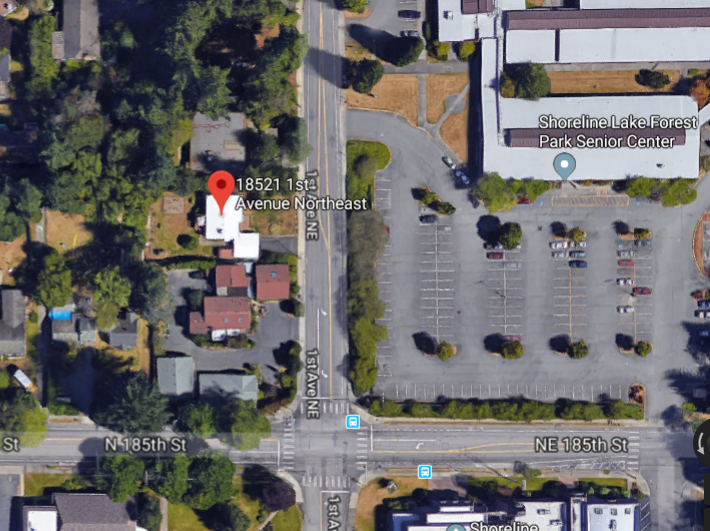 Citizens are invited to hear a presentation for a proposed development at 18521 1st Ave NE. At this meeting specific details of the project will be shared and comments will be solicited from the neighborhood. The meeting will be held on Monday, January 29, 2018 at 5:30pm in the Shoreline Conference Center, Hamlin room in the south end, classroom wing. 18560 1st Ave NE, across from the building site. The proposed project is for seven townhomes to be constructed. The project will be completed in three phases. The first phase of the project includes the demolition of the existing single family residence on the property, to include asbestos inspection, capping and/or abandoning existing utilities and removal of the house. The second phase of the project will be a building permit for the construction of seven dwelling units, the first being 840 square feet with a 25 square foot porch and the other six being 640 square feet. All units will have ground floor parking spaces which will be accessed through a private driveway. They will also have access to a private walkway connecting to 1st Ave NE. The last phase will be the submittal of a short plat to subdivide the property into seven individual lots for sale of the townhome on each lot. This phase of the project includes a Short Plat, Site Development Permit, and Right of Way Permit. Gee.... more townhomes at $750,000 a pop? Gross, tacky, urban blight. What about the traffic and bike lane on 1at NE?